It was sometime in the 1560s, a band of wandering minstrels was exhorting Moinuddin Chishti to be their guiding star, when the great Moghul emperor Akbar heard the strains of the melodious music … he knew he had to go to Ajmer. From then on, every year, for years to come, Akbar wound his way to Ajmer in Rajasthan to pray at the shrine of the Sufi saint and distribute alms among the poor. Whether it was to celebrate a battle or pray for a son, the emperor looked to Moinuddin Chishti. Sometimes he would undertake the journey of 300km from Agra, other times from Fatehpur. Nusrat Fateh Ali Khan's father did not want him to follow in his footsteps and become a qawwal (devotional singer). Instead, he saw visions of his son being a doctor. But Nusrat had other dreams — they painted another picture. The child did not understand why a white shrine appeared before him as he shut his eyes at night. His relative explained why, and Nusrat knew instantly his calling had come. In 1979, the mighty qawwal Nusrat Fateh Ali Khan from Pakistan realised his dream: he sang at the dargah (shrine) of Moinuddin Chishti. In early 2011, Bollywood's emperor-in-waiting Shah Rukh Khan travelled to Ajmer. He asked nothing for himself because God had given him enough, but prayed for family and friends. A few weeks later, the emperor, Amitabh Bachchan, journeyed to Ajmer after a 40-year-old wish was fulfilled. So what pulls one of history's greatest conquerors, one of qawwali's (genre of devotional music) finest exponents and two of Bollywood's biggest giants to Ajmer? What possibly could Akbar, Nusrat Fateh Ali Khan, Shah Rukh Khan and Amitabh Bachchan have in common? One craved for land, wealth and power, the other longed to be lost in the love of the Almighty through his song and the other two seek to enthrall millions around the world. But then again, what brings the billions of Muslims, Hindus and Christians of India each year to Ajmer? Moinuddin Chishti was born in 1138-39 in Sistan in Persia. His parents died when he was 15 or 16. The boy inherited an orchard and a millstone to eke out a living, but he was drawn towards spirituality after meeting a dervish Ebrahim Qandoozi. The young Chishti set out to find a guide and was led to Osman Harouni, a scholar of great repute. He stayed with his teacher for many long years, mastering religious studies. And when the time was right, Harouni and Chishti left for Haj and then proceeded to Madinah. It was there that a longing was born to settle in Ajmer. Rajasthan or Rajputana, as it was then known, was a treasure. Kings and conquerors desired Rajputana. But Chishti wanted nothing of kings and conquerors: he wanted to serve the poor, the hungry, the wretched, the unwanted, the widow, the orphan. He settled on a hill close to Ana Sagar Lake. Chishti was about 50 then; Rajputana was ruled by the formidable Prithviraj Chauhan; the people of the barren land were suspicious of a fakir, who they did not know was a scholar, a philosopher, a man who had paid obeisance to the greatness of another Sufi, Abdul Qader Jeelani of Iraq. The plot had only begun to unfold. History is full of stories of how Prithviraj Chauhan grew suspicious of this fakir, and even asked one of his councillors Ajai Pal, supposedly the master of magic, to neutralise him. The fakir won over both king and councillor — not through magic or violence but through his undeterred belief in peace. The path of non-violence and love was the essence of his thought. He was steadfast in his conviction that bringing happiness to the heart was the supreme prayer. No one would go hungry from his doorstep as food was prepared all day. Chishti himself fasted regularly and ate sparingly. And because of his complete devotion to the poor and hungry, he is called Garib Nawaz or ‘helper of the poor'. The Indian subcontinent in the 12th century was a cauldron of political tumult. The raids by Mahmud of Ghori, the resistance of the Rajputs and battle for Delhi — the land was turbulent. But Moinuddin Chishti spurned politics, had little time for king and courtier. His sole mission was to soothe human pain. The soul was to be fed through prayer, tolerance and love. Devotional music was an avenue to realise the Almighty. If there was no humanity, no compassion, no understanding, no consideration, there was no life. Streams of people came to him every day, some looking for spiritual healing, some for emotional sustenance, and some were just plain hungry. Chishti sheltered them all: he healed wounds and fed empty stomachs. For about 40 years, he devoted himself to the people of Ajmer and surrounding areas, and as he grew old, the question was who would fill the void that would be left behind by this larger than life man. Delhi was to be the next stage. Another great Sufi and his favourite disciple — a courtier humoured by his kings, a man of words, a poet with a love of music — were to change the course of history. Chishti passed away in 1230 and was buried in his prayer room. For centuries later kings, courtiers, leaders, people from all faiths have flocked to Chishti's grave in Ajmer. Two massive cauldrons were presented to his shrine — one by emperor Akbar and the other by his son and successor Jahangir. One of the cauldrons can cook 4,800kg of food, while the other 2,400kg. All the food (langar) is distributed among the poor. In 1911, the British government built a roof over the water tank to commemorate Queen Mary's visit to the shrine. Qutbuddin Bakhtiyar Kaki of Delhi carried on the work of Chishti and he handed the baton over to Baba Farid or Ganjshakr of Pakpattan in Pakistan. Baba Farid believed in the same principles inculcated by Chishti, but as he spread tolerance, love and compassion among his people, he waited for someone to come. Nizamuddin's affluent family was based in Bukhara, but they had to flee the land because of the constant Mongol raids that grew in ferocity and ruthlessness. They moved to Badaun in central India. Nizamuddin, born in 1238, lost his father when he was a boy and was brought up by his mother, Bibi Zulaikha, a deeply religious woman, who instilled piety in the child. They were impoverished — for days there would be nothing to eat. When Nizamuddin would return from school hungry, he would ask his mother what there was to eat. And she would reply: "Today, we are the guests of God." Nizamuddin knew then there was not a morsel at home. And just as emperor Akbar had heard of Chishti after a band of minstrels was exhorting him, Nizamuddin heard of Baba Farid through one such singer. He knew he had to go to his master. And when the time was right, he travelled to Ajodhan to see Baba Farid. He stayed with him for months, imbibing the principles of tolerance, love of all human beings across all faiths and compassion. Nizamuddin healed the human heart. His principle was simple: if an enemy places thorns before you and you place thorns in his path, there will be thorns all around. There could be no room for hate. Nizamuddin finally settled in Ghiyaspur in Delhi on the banks of the Jamuna River. Like Chishti, he led an austere life and propagated the purity of thought. The root of the word Sufi is traced to Safa — Arabic for purity. Some believe it means wisdom, while others say Suf was the woollen cloak worn by ascetics. Food flowed aplenty as people gave generously. The kitchen of his home was busy through the day, feeding the poor and hungry. He, like Chishti fasted all day and ate very little. Food would not go down Nizamuddin's throat if someone had gone to sleep hungry. His days were spent in prayer and healing the hurt. He abhorred the politics of Delhi and had little time for kings and emperors. 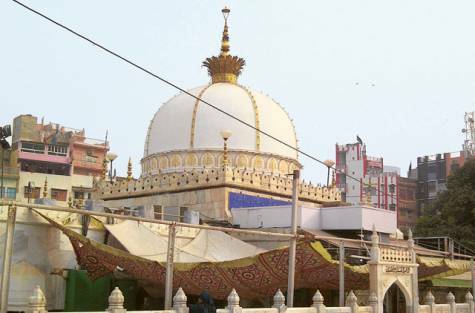 Though several expressed their desire to see him, Nizamuddin would not entertain them. He wanted nothing of king and courtier, save for one: Amir Khusro. Nizamuddin, like Chishti, Kaki and Baba Farid, believed in Sama, a Sufi practice of listening to music, as a form of prayer. The birth of Sama is credited to another great Sufi Rumi, who also lived in the 13th century. But Khusro was to give Nizamuddin something special — the qawwali. Derived from the Arabic word Qual meaning utterance of the Prophet, Khusro wrote Qawwali in Persian and Hindavi, languages spoken in India in the 13th century. Khusro spoke of divine love — where the lover longed for union with her maker. He once wrote of Chishti: My courtyard is blessed as my love has come home. If two lovers spend the monsoon together, the night is blessed for the bride. The monsoon in which my love doesn't come home, let that monsoon be set on fire. Nizamuddin was indulgent towards Khusro, who made him his master at the age of eight. Of Turkish descent, Khusro served his political masters, but his heart was with Nizamuddin. Khusro was away in Bengal on a campaign when Nizamuddin passed away. On hearing the news, he rushed back to Delhi and went to his master's grave. Stricken by grief, he said: The fair maiden lies on a bed of roses; Her face covered with a lock of hair; Let us O' Khusro, return home, the dark dusk blankets the four corners of the world. Such was the love between master and disciple that Khusro passed away of grief within six months of Nizamuddin's death in 1325. They are buried a few metres apart in a shrine in Delhi in an area named Nizamuddin, what was once called Ghiyaspur. The picture was now complete. Nizamuddin and Khusro were testament to what Chishti professed — the complete love between human beings, no matter what difference there might be. Nizamuddin was an impoverished fakir, who spent day and night in prayer, in healing hearts, in shunning what kings and courtiers pined for — power. Khusro was a courtier who served king after king, and yet there was a primordial bond. There was a meeting point: the love of the Almighty and the love of humanity. Both Chishti's and Nizamuddin's death anniversaries are celebrated as Urs [an Arabic word meaning wedding celebration] as there is no grief at death because the disciple is finally reunited with his maker. The lover's longing for the Almighty sees fruition. And that is ultimate joy, the Sufi's dream. So why do the millions of Indians — Muslims, Hindus, Christians and Sikhs flock to Ajmer? Why do they stream into Nizamuddin's dargah? Why do the rich and the famous, leaders and politicians, make it a point to visit Chishti's grave? Do these shrines soothe troubled souls? Do these shrines fulfill dreams? Do these shrines answer prayers? Perhaps, they do. But what is certain is that the shrines are homes to humanity. The convictions and beliefs of two men born centuries ago are alive and provide refuge to the poor, the hungry, the wretched, the widow and the orphan. Eight centuries on, no one goes hungry from their doorsteps. The lamps in the shrines will always glow because they are symbols of unity, of religious tolerance. They are symbols of kindness and compassion. They are testimony to hope.